The BMW 3 Series gets a modest makeover but underneath there are some fascinating changes. Jonathan Crouch takes a look. The BMW 3 Series features a whole stack of changes under the bonnet, including a four-cylinder 330i and a three-cylinder entry-level 316i, as well as new diesel engines. From the outside, it looks much as before, with only a few very subtle styling tweaks. But it's still likely to represent the class benchmark. Since 2012, when BMW introduced the sixth-generation 3 Series to its range, not a lot of remedial work has really been necessary. BMW's compact executive weapon was deployed, it decimated the field and normal service was resumed. Fire and forget, if you like. But, as you can imagine, rivals in the compact executive sector don't tend to take that sort of treatment very well and since the launch of the original MK6 model 3 Series, Audi, Mercedes, Lexus and Jaguar have all launched talented all-new rivals into this segment This is BMW's response, a smarter-looking, more efficient, cleverer 3 Series. You'll need to be in the know to fully appreciate the significance of the changes that have been made but take some time to understand BMW's thinking here and it's hard not to be impressed. If you're of a generation who remembers the badge on the back of a 3 Series denoting its engine size, you might be a bit confused by the latest line-up. The 330i, for example, no longer packs a six-cylinder lump, instead squeezing 252PS from its turbo four, replacing the old 328i in the process. If you do want a six-cylinder petrol engine, BMW will sell you the 340i, a new variant that wings in with 326PS (the same as the old 'E36' M3 Evo super-coupe) and will take a blink over five seconds to get to 62mph. At the other end of the petrol engine range is - and you might want to take a seat for this - a 136PS three-cylinder 1.5-litre engine that's been pinched from the MINI line. Most of the diesel engines are heavily modified or new. At the base of the range is the 116PS 316d trim and the 150PS 318d, but the most attractive models will likely be the 320d and 320d Efficient Dynamics. The regular 320d weighs in with a gutsy 190PS, for a 0-62mph time of 7.2sec in automatic trim. The aforementioned 320d ED wields a more modest 163PS but retains the same 400Nm torque, so it's not much slower but it is a whole lot more economical. The 258PS 330d is automatic only and scuttles to 62mph in 5.6sec, while there's a 313PS 335d at the top of the tree with a huge 630Nm. BMW will continue to offer the 3 Series with its xDrive four-wheel drive system. It's available as an option on the 320i, 320d and 330d and is standard on the 335d. Munich has also made big advances with the latest eight-speed Steptronic transmission. When you pause to consider that one product line - the 3 Series saloon - accounts for fully a quarter of BMW's global sales, you begin to appreciate quite how much there is riding on this car. That's why you won't see out-there updates, divisive styling or radical technology pioneered on a 3 Series. It's a car that needs to appeal to an awful lot of people. In the UK, only the 318d, 320i and 320d models will be offered with all four trim levels: SE, Sport, Luxury and M Sport, so expect these models to make up the lion's share of domestic sales. Choose the entry-level 318i and 316d models and you get a choice of SE or Sport trim only. Go for the mainstream SE trim and you get cloth seats and a reduction in interior chrome jewellery. The Luxury, Sport or M Sport models get an accent strip in the instrument panel that continues into all four doors, while Sport and Luxury trims get leather upholstery. Business Navigation is now standard on all 3 Series saloon and Touring models. And yes, you can still get the barnstorming M3 super-saloon variant. Prices sit in the £25,000 to £40,000 bracket and there's a premium of around £1,500 to go from the saloon to the Touring estate variant. BMW has concentrated on improving the efficiency of the 3 Series and there are benefits right across the board. The three-cylinder petrol engine records CO2 emissions of just 122g/km (with the eight-speed Steptronic transmission), a 12% improvement over the previous BMW 316i. Fuel consumption is equally impressive, with the saloon returning up to 54.3mpg and the Touring estate version 51.4mpg. 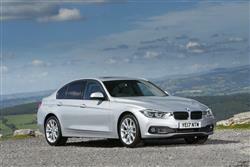 The 320i isn't far behind with CO2 emissions of 134g/km and fuel consumption of 48.7mpg. Of course, most UK customers will look to the diesel engines and they're not going to be disappointed. For example, the 316d returns up to 68.9mpg, with CO2 emissions of only 109g/km. Go for the pokier 320d and though you get more power (up from 184 to 190PS), emissions have been reduced by 6% to just 111g/km, not at all bad for a car that can hit 143mph. The Steptronic automatic transmission option now features a coasting mode so that when the driver lifts off the throttle at higher speeds, for example on a gentle downhill grade on the motorway, the engine is automatically decoupled from the powertrain. It then simply ticks over in neutral, which saves fuel and ensures there is no unwanted engine braking at high speed. An additional fuel-saving feature, which also improves driving comfort, is the new Proactive Driving Assistant, which uses information from the navigation system to "anticipate" upcoming roundabouts, corners and junctions and select exactly the right time to change gear. 'More where you need more and less where you want less - otherwise leave well alone' seems to be the mantra of this latest BMW 3 Series. If BMW wanted to build a model that would convert those who didn't previously fancy a 3 Series, then this revised MK6 design isn't that car. Its appeal is largely the same. If, on the other hand, you're crunching hard numbers, then it's hard to see this Munich maker's much improved compact executive model coming off second best to anything in its division. The class-leading rear-wheel drive driving dynamics are merely the icing on the cake. Beneath the low-key styling changes and modest interior meddling are some serious engineering updates. A new family of petrol engines and big changes to the diesel powerplants comes winging in, delivering unprecedented performance/economy combinations. The 3 Series has changed a lot about the way we buy cars in this class, continually forcing its rivals to play catch up. This one's no different. As you were, people.